Weather is a moving phenomenon. Obtaining useful data about it requires collecting observations taken over wide ranges of territory. Determining what to measure and how to gather the measurements reliably and consistently were major challenges during the infancy of this science—even as researchers began interpreting the data. Maps became essential tools in the analysis. Portrait of Edmond Halley, at age eighty. From vol. 1 (1833) of The Gallery of Portraits: With Memoirs (London: C. Knight, 1833–1837) [General Library Collection]. 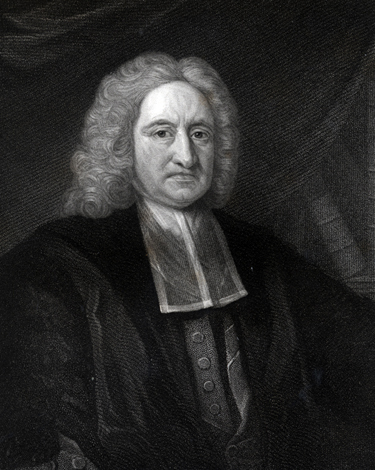 Best known for the comet bearing his name, English astronomer Edmond Halley applied his scientific talents in many other fields, including meteorology, geophysics, and mathematics. As an undergraduate at Oxford, he published papers on the solar system and sunspots. In 1679, his publication Catalogus stellarum australium, providing details on almost 350 southern hemisphere stars, earned him election to the Royal Society. Subsequently, he studied trade winds and monsoons, established the relationship between barometric pressure and elevation, designed and demonstrated the use of a diving bell in the Thames River, and published an article (1693) on life annuities that helped foster the development of actuarial science. In Astronomiæ cometicæ synopsis (1705), he postulated that the comet sightings of 1456, 1531, 1607, and 1682 related to the same comet, and extrapolated its return in 1758. But Halley did not live to witness the truth of his prediction. In map circles, Halley is usually considered to be the first thematic cartographer. [Below] An untitled, copperplate world map, 14.8 × 48 cm. French version of Halley's map, accompanying a French translation of his article "An Historical Account of the Trade Winds, and Monsoons, Observable in the Seas between and near the Tropicks, with an Attempt to Assign the Phisical Cause of the Said Wind," which had appeared several months earlier in issue no. 183 (1686) of the Philosophical Transactions of the Royal Society. From Bibliothe`que universelle et historique 4 (1687): 66-93 [Rare Books Division]. First meteorological map, charting the directions of trade winds and monsoons. Having collected information from navigators familiar with ocean transits, and also from his own tropical experience on St. Helena (1677–1678), Halley sought to rectify the work of earlier writers on the subject. He attributes the circulation of prevailing winds to the solar heating of volumes of atmosphere as the earth revolves, which thus draw air after them, forming a generally easterly wind; as the sun departs, the air reverses direction to establish equilibrium. He argues that the effects of continents (and other landmasses) and latitudes complicate but do not compromise the basic principle. (Today, of course, solar heating is viewed as only a piece in the puzzle of winds; ocean currents would be another. Adding Halley’s wind map data to Eberhard Happel’s 1675 map of ocean currents [see his entry in the Hydrography section] would make an interesting thematic map.) Elsewhere in the article, Halley correctly identifies the West Indies as the source of hurricanes in the Atlantic. To help the conception of the reader in a manner of so much difficulty, I believed it necessary to adjoyn a Scheme, shewing at one view all the various Tracts and Courses of these Winds; whereby ’tis possible the thing may be better understood, than by any verbal description whatsoever [pp. 162–163, from his Philosophical Transactions article]. “A New and Correct Chart Shewing the Variations of the Compass in the Western & Southern Oceans as Observed in ye Year 1700 by . . . Edm Halley” [London: s.n., 1701?] Copperplate map, with added color, 56 × 48 cm [Historic Maps Collection]. Princeton’s copy is an unrecorded state. 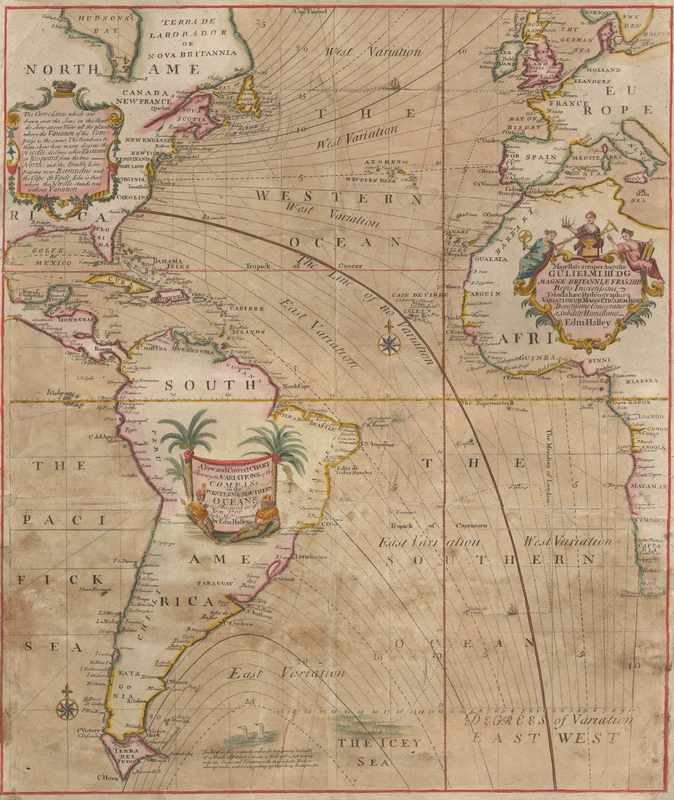 In 1698–1700, Halley’s explorations in the Atlantic Ocean aboard the fifty-two-foot Paramore, from about 52° N to 52° S, led to this printed map, the first of its kind and the first to use isogonic lines, showing equal declinations of the magnetic compass. It became a model for how to show geographical observations and is recognized as one of the most important maps in the history of cartography. Halley and others felt that data maps like these might solve the longitude problem for seamen, as they could look up their locations by comparing their compass readings to those on the map. Unfortunately, such readings are not stable over time because the earth’s magnetic pole shifts. And Halley’s own longitude readings were unreliable. "Carte des lignes isothermes." 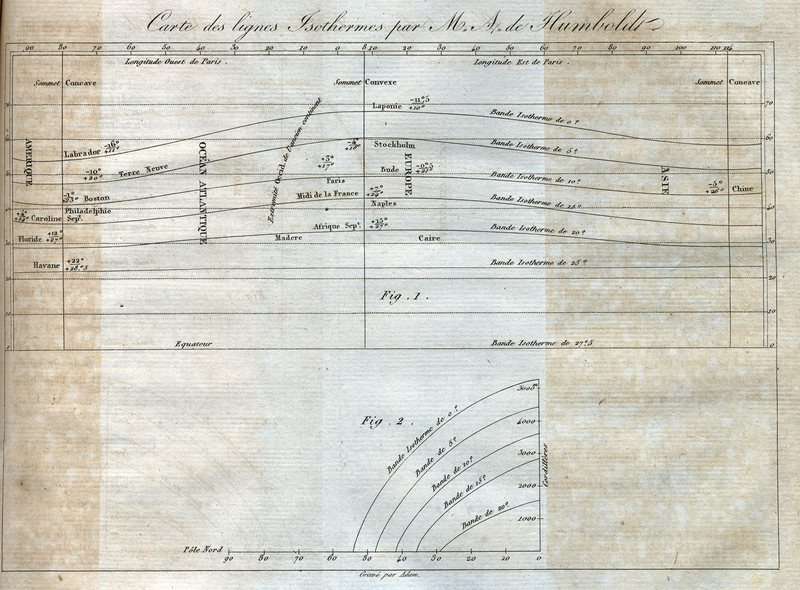 Copperplate chart, 14.3 × 21.9 cm, accompanying Humboldt's article "Sur les lignes isothermes." From Annales de Chimie et de Physique 5 (1817): 102–112 [Historic Maps Collection]. 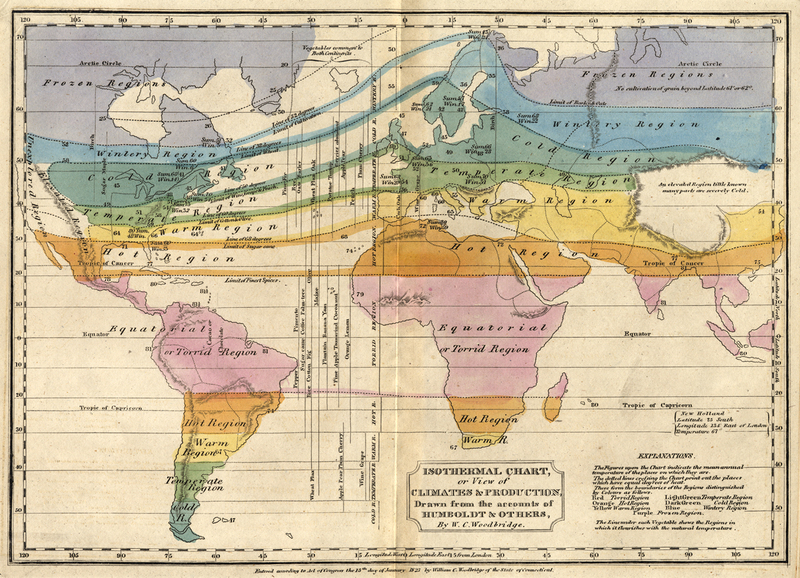 Humboldt "raises the bar," literally: this is the first map to show the use of isotherms, a term Humboldt coined for lines of equal temperature. The graph in the bottom right shows the relationship between temperature and latitude/altitude. Despite its pictorial simplicity, the map revolutionized physical geography and all future thematic mapping. Portrait of William C. Woodbridge. From vol. 1 of Henry Barnard’s Educational Biography: Memoirs of Teachers, Educators, and Promoters and Benefactors of Education, Literature, and Science, Reprinted from the American Journal of Education (New York: F. C. Brownell, 1859) [Rare Books Division]. 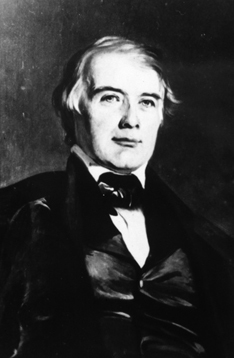 Son of a minister who pioneered female education, William Woodbridge became a strong voice for American educational reform, particularly in geography. He graduated from Yale in 1811 at the age of sixteen, intending to become a missionary, but ill health (he suffered from scrofula throughout his life) led him to teaching. Ultimately, he became an instructor at the Asylum for the Deaf and Dumb in Hartford, Connecticut, with Thomas Hopkins Gallaudet. Working with the deaf and disabled helped Woodbridge discover the power of visualizing information, and this approach accounted for much of the success of his geographies, many of which he coauthored with Emma Willard (1787–1870), founder of the first women's school of higher education. Woodbridge traveled to Europe several times, becoming a member of the geographical societies of Paris, Berlin, and Frankfurt, and meeting the influential geographer Alexander von Humboldt, who showed how a physical map could be the foundation for a broad range of themes. Back home, he sought to introduce European geographical concepts into American textbooks, preaching against rote memorization and promoting an understanding of unifying ideas. He wanted more and better maps in classrooms and books. In 1831, Woodbridge purchased the American Journal of Education, renamed it the Annals of Education, and with William A. Alcott (1798–1859) turned the Boston publication into the leading American educational periodical. [Above] “Isothermal Chart, or View of Climates & Production, Drawn from the Accounts of Humboldt & Others,” dated January 13, 1823. Engraved map, with added color, 20.3 × 28.2 cm. From Woodbridge’s School Atlas to Accompany Woodbridge’s Rudiments of Geography: Atlas on a New Plan . . . (Hartford, Conn.: Oliver D. Cooke & Co., ) [Graphic Arts Collection]. The foundation of geographical knowledge must be laid in a knowledge of the relative situation of places, and this, the pupils of our schools must acquire chiefly through the medium of maps. . . . Indeed, it is only by this process of comparison, that the great objects of geography—the expansion of the mind, and the discipline of the reflective powers—can be attained [The Introductory Discourse and the Lectures Delivered before the American Institute of Instruction, in Boston, August, 1833 . . . (Boston: Carter, Hendee and Co., 1834), 212, 231]. Portrait of James P. Espy. From the National Oceanic and Atmospheric Administration (NOAA) Photo Library. The youngest of ten children, James P. Espy was born in Washington County, Pennsylvania. His father was a pioneer farmer. 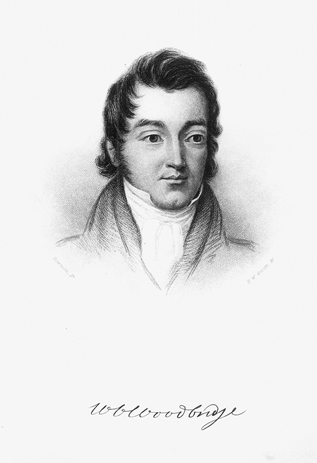 After studying law with his uncle, Espy practiced the profession in Xenia, Ohio, from 1814 to 1817, when he moved to Philadelphia and began teaching mathematics and classics. Some of his classes were at the Franklin Institute, beginning a more than twenty-year association with that important American scientific organization. In the 1830s, his interests turned to meteorology, and he found a scholarly outlet in the Institute’s journal. During this time he also established a committee on meteorological observations and persuaded the state to create a network of county weather observers supplied with basic instruments to complement his volunteer national system. From 1839 to 1841, Espy lectured widely in the United States and abroad, earning him the nickname of Storm King. His work The Philosophy of Storms (1841) espoused his thermal theory, whereby all atmospheric disturbances involved the movement of heated air and its ultimate caloric release. The next year he moved to Washington, D.C., working for the government first as a mathematics teacher in the navy and then as meteorologist for the Army Medical Department. For ten years (1847–1857), he was assigned to the navy and issued several of his important meteorological reports as U.S. Senate documents. Espy also had a prominent role in establishing the Smithsonian meteorological system of weather observers (see also Elias Loomis in this Meteorology section), which became the basis of a national system. First U.S. weather map. In his accompanying report, Espy states that the committee received back 50 responses from the 250 circulars it sent out to different parts of the United States and Canada regarding this notable storm. The map represents the assembled data, with reporting stations numbered from 1 to 50, roughly in order from south to north and from west to east as the storm was tracked. Among them were Franklin (La., #1), U.S. Frigate Constellation (Pensacola Bay, Fla., #5), Nashville (Tenn., #7), Warren Court House (Ill., #9), Springfield (Ohio, #14), Western Reserve College (Hudson, Ohio, #17), Charleston (S.C., #19), Capitol Hill (Washington, D.C., #23), Gettysburg (Pa., #25), Bucks County Academy (Pa., #32), Philadelphia (Pa., #34, by Espy himself), University of Vermont (Burlington, Vt., #40), Newport (R.I., #44), Brown University (Providence, R.I., #45), Williams College (Mass., part of #47), Concord (N.H., #48), and Portland (Maine, #50). Reports published in newspapers were also consulted. “Map Embodying the Information Received by the Committee on Meteorology of the Franklin Institute of the State of Pennsylvania in Relation to the Storm of March, 16th, 17th, & 18th, 1838, Illustrating the Report of the Meteorologist.” Lithograph map, 23 × 27 cm. 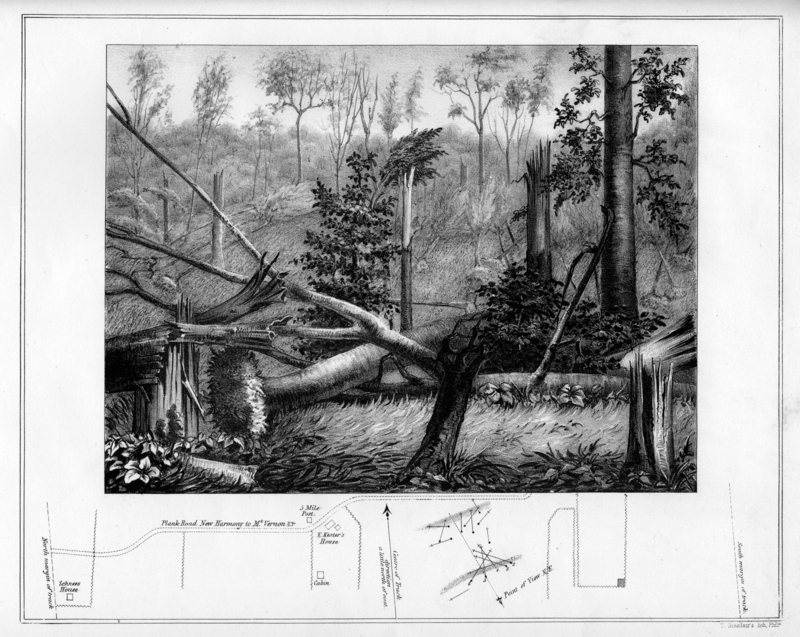 From Espy’s “Report of the Committee on Meteorology” in Journal of the Franklin Institute of the State of Pennsylvania and Mechanics’ Register. Devoted to Mechanical and Physical Science, Civil Engineering, the Arts and Manufactures and the Recording of American and Other Patented Inventions, n.s., 22 (1838): 161–175 [Historic Maps Collection]. 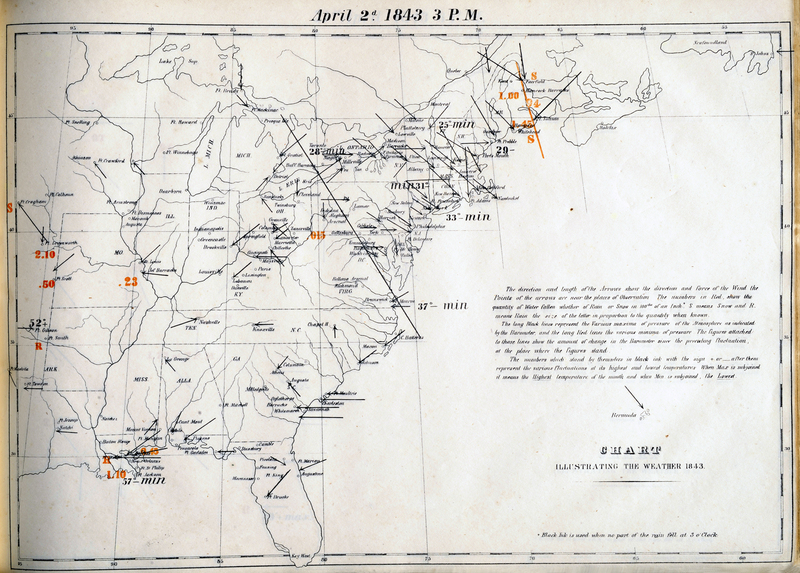 [Above] First two weather maps (“April 1st 1843. 3 P.M.” and “April 2nd 1843. 3 P.M.”) from Espy’s Second [-Third] Report on Meteorology (Washington, D.C., 1849–1851) [Historic Maps Collection]. In his second report, Espy provides the names and city/state locations of all of the “meteorological correspondents” who provided the data exhibited in his charts. Then he turns to their contents. By casting your eye on one of the charts, you will see how easy it is to comprehend all the principal phases of a storm at once; the position and extent of a storm at a particular moment by the red figures, indicating the quantity of rain or snow that fell in it; the locality of the minimum barometer indicated by a red line, and its maximum by a black line; the direction and force of the wind, by arrows of different lengths; and by turning to the map of the next day, the change of position of the storm will also be seen [Espy’s emphasis; pp. 4–5]. The black numbers standing by themselves, with + or – signs appended, indicate the high and low fluctuations of temperature; when max is added, it means the highest temperature of the month, min, the lowest. 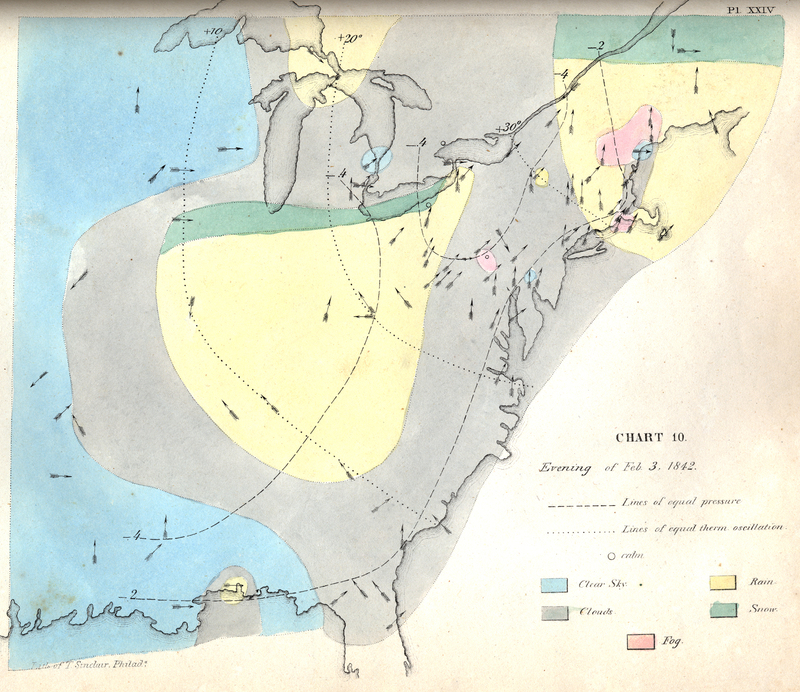 Since the earlier map of 1838, Espy has achieved a simplification that improves visualization of the weather data, but the results are not yet intuitive. Elias Loomis was a professor of mathematics and natural philosophy (Western Reserve, New York University, Yale). Although he became an author of a best-selling series of textbooks on mathematics and an introduction to astronomy, his research interests—and contributions to science—were more meteorological. In the United States in the early 1840s, two basic theories of winds in storms found support but reached no verdict: do winds blow in circular whirls, or do they blow in toward a center? 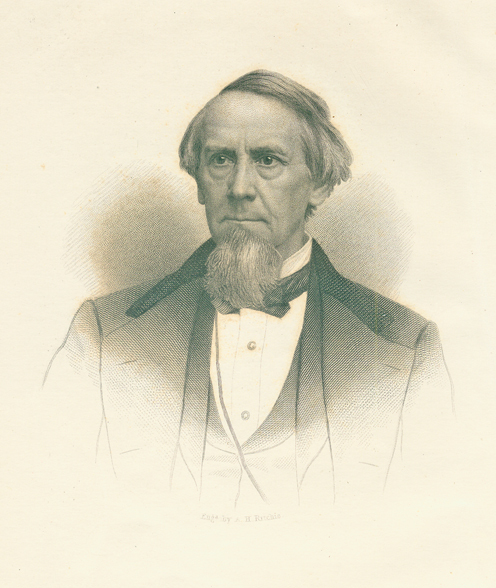 William C. Redfield (1789–1857), first president of the American Association for the Advancement of Science, presented facts that winds blew counterclockwise around a center that advanced in the direction of the prevalent winds. James Pollard Espy (1785–1860), appointed the first meteorologist of the U.S. government and popularly known as the Storm King from his extensive lecturing, observed a centripetal motion of the winds toward a center and theorized that there was an upward motion of air at that center. To provide an answer, Loomis determined to make a thorough examination of a violent storm. In February 1842, he investigated the paths of two large storms moving across the eastern half of the United States. His published observations were not definitive, in that they supported features of both rival wind theories—but his more important contributions were in his methodology and mapping. By tracking the storms over a wide area for several days, he was able to accurately chart the storms’ courses and show their meteorological changes. In two series of sequential maps (dated morning/evening, day), he drew lines of equal deviations in barometric pressure and equal oscillations in temperature, and assigned colors to areas of clear sky, clouds, rain, snow, and even fog. In addition, Loomis used arrows of varying length to indicate wind direction and intensity. 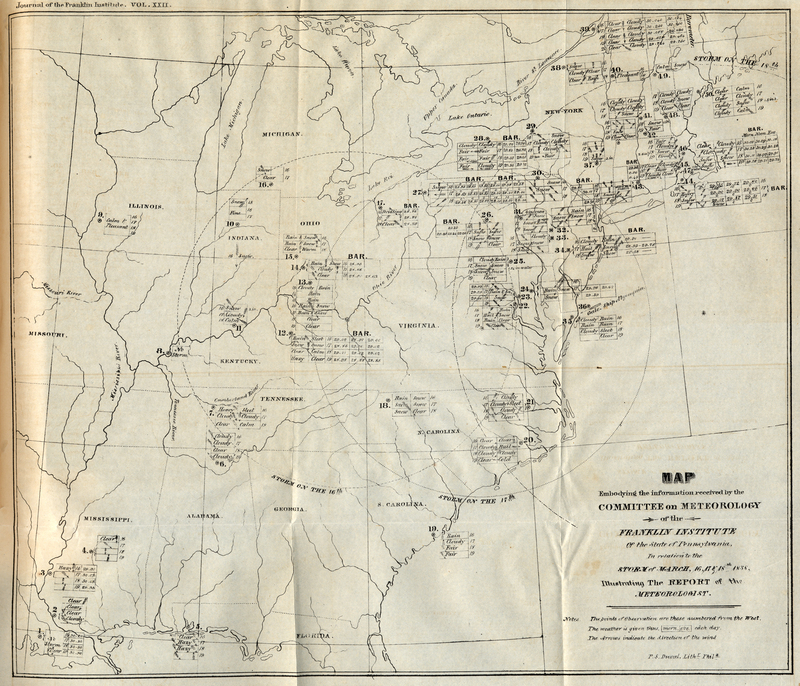 In fact, he was anticipating common characteristics of the modern weather map: when the Signal Service’s weather maps began appearing in 1871, they were constructed on Loomis’s model. Portrait of Elias Loomis. From H. A. Newton’s Elias Loomis, LL. D., 1811–1889 (New Haven, Conn.: Tuttle, Morehouse & Taylor, 1890) [General Library Collection]. [Below] “Chart 10.” Printed map, with added color, on sheet 23.5 × 30.5 cm. 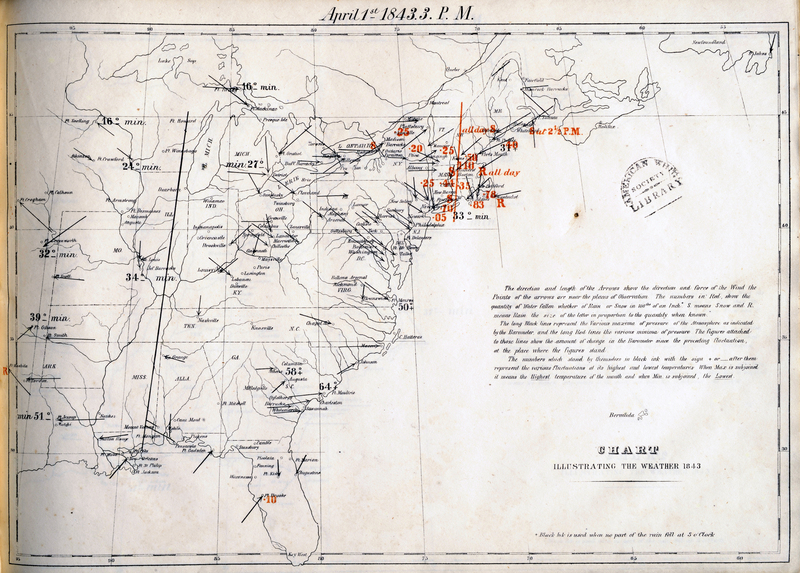 One of thirteen charts accompanying Loomis’s article “On Two Storms Which Were Experienced throughout the United States, in the Month of February, 1842.” From Transactions of the American Philosophical Society, 9 (1845): 161–184 [Historic Maps Collection]. Charts 1–5 cover the storm of February 16; charts 6–13 cover the storm of February 3. If we could be furnished with two meteorological charts of the United States, daily, for one year, charts showing the state of the barometer, thermometer, winds, sky, &c., for every part of the country, it would settle for ever the laws of storms. . . . Such a set of maps would be worth more than all which has been hitherto done in meteorology. . . . A well arranged system of observations spread over the course of the country, would accomplish more in one year, than observations at a few isolated posts, however accurate and complete, to the end of time. . . . We need observers spread over the entire country at distances from each other not less than fifty miles. This would require five or six hundred observers for the United States [pp. 183–184]. 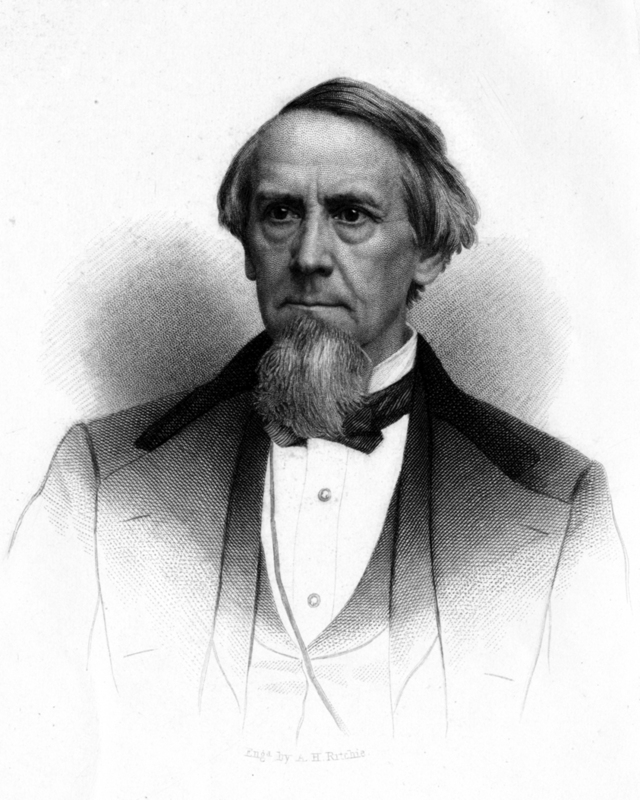 He later developed a plan for Joseph Henry, secretary of the Smithsonian Institution, but only a fragmentary implementation resulted. Ultimately, Loomis’s proposal for a system of observers across the United States and for daily weather maps was realized in Congress’s creation of the Weather Bureau of the United States Signal Service in 1870. This became the National Weather Service we know today. One-page autograph letter by Loomis, addressed to the Boston Journal and dated 1 October 1859 [Moore Autograph Collection of Princetonians, Manuscripts Division]. 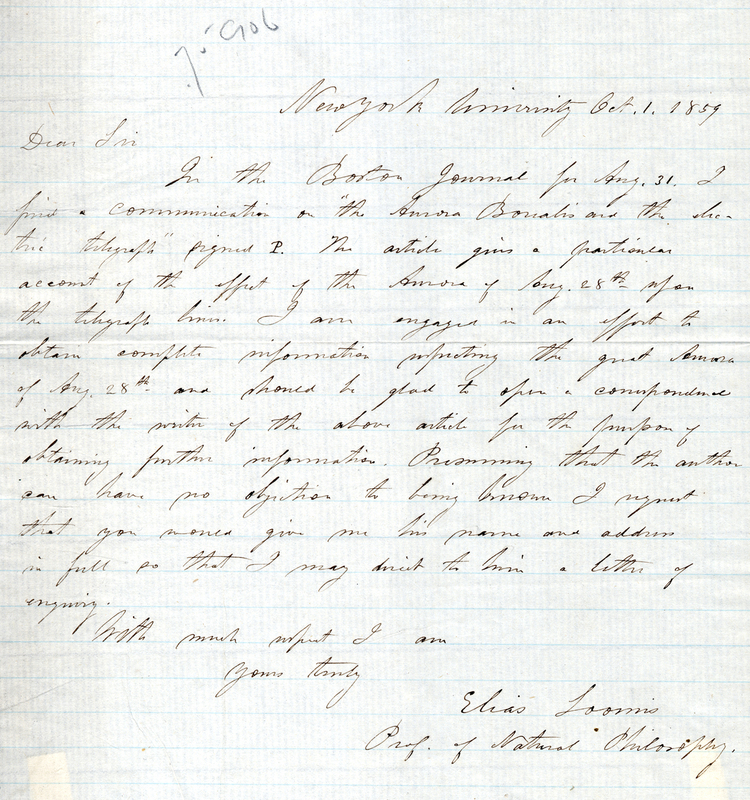 Loomis’s letter reflects the laborious work of a mid-nineteenth-century meteorologist trying to track down and collect data from distant sources. The subject of the letter is the extraordinary aurora borealis display that occurred throughout the United States, Europe, Japan, and Australia, from August 28 through September 4, 1859, which is considered to be the most spectacular of recorded history. Loomis would publish nine scientific papers on the Great Auroral Exhibition of 1859 from the data he collected. A graduate of France’s École Nationale des Ponts et Chaussées (National School of Bridges and Roads), the world’s oldest civil engineering school, Léon Lalanne had a successful career managing public works in Romania, constructing railroads in Switzerland and Spain, and eventually directing his alma mater. 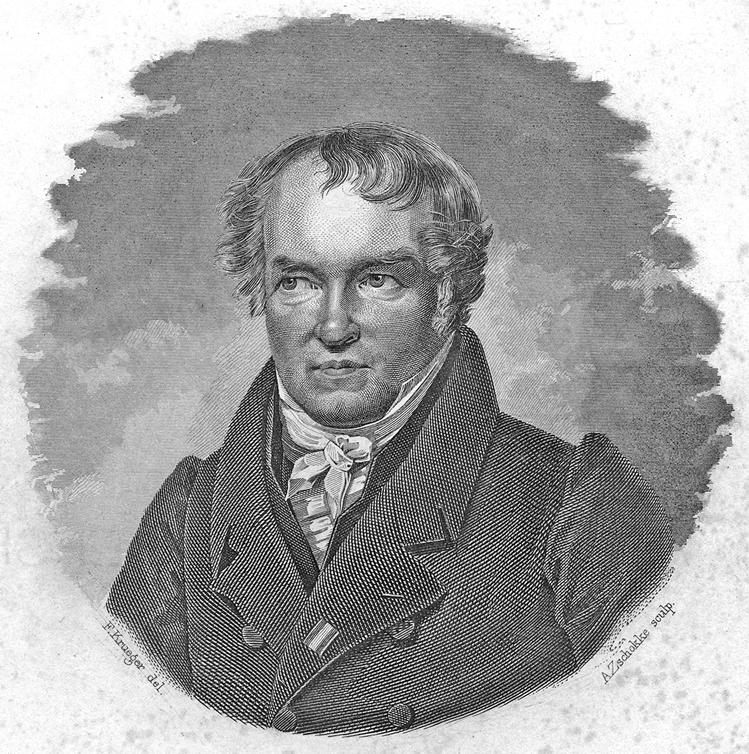 In 1837, Lalanne was one of a team of mostly French scholars, scientists, and artists that were invited on a scientific expedition to southern Russia and the Crimean Peninsula, organized by the Russian mining industrialist Anatoliĭ Demidov. When Lalanne retired from the ENPC, he entered politics and was elected senator for life in 1883. His strength in mathematics led to a number of important graphical contributions, including the very first log-log plot or logarithmic grid, a “universal calculator” that allowed one to read off the product of more than sixty functions of arithmetic, geometry, and trigonometry—essentially a one-sheet graphical slide rule. [Below] "Abaque ou Compteur Universel . . . ." Lithograph chart, 20 × 20 cm, with explanatory text, "approuvé par l'Académie des Sciences" on 11 September 1843. From Bulletin de la Société d'encouragement pour l'industrie nationale 45, no. 502 (April 1846) [General Library Collection]. Lalanne's ingenious graphic calculator (abacus). 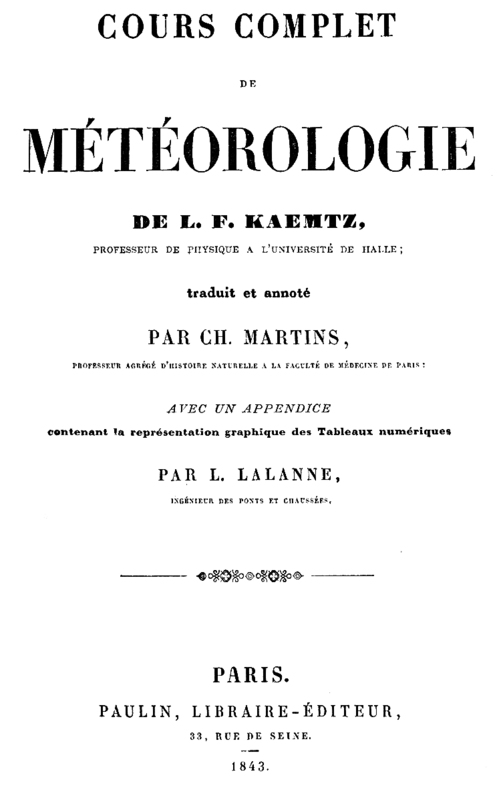 Title page of Ludwig Friedrich Kämtz’s Cours complet de météorologie, trans. and annotated by Ch. Martins, with an appendix by L. Lalanne (Paris: Paulin, 1843) [Historic Maps Collection]. 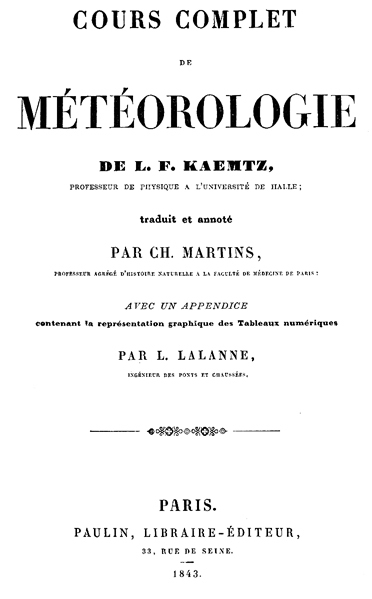 An early, very influential book on meteorology by German meteorologist Kämtz. Translated into numerous languages, the work is considered a landmark in the history of science. Lalanne’s contribution to the volume, “Appendice sur la représentation graphique des tableaux météorologiques et des lois naturelles en général,” consists of forty-two meteorological graphs with explanatory notes. Whatever be the plan, we are convinced that the graphic representation of natural or mathematical laws with three variables, that the substitution of indexed planes for numerical tables with a double entry is a fertile idea, that will not fail in bearing fruit. When meteorologists, philosophers, and engineers, shall become familiar with the employment of this process, they will be in a better condition for discussing the results of their experiments, of directing their researches, of simplifying their calculations, than if they operate directly on numbers . . . [p. 511]. M. de Humboldt was then the first who thought of uniting on the surface of the globe, by continuous curves, other points than those that are found at the same level above the ocean. The analogy of his isothermals, with the application that we make to meteorological laws, is manifest. The difference consists merely in that the isothermals are applied to points, the existence of which on the surface of the terrestrial globe is real; whilst the curves of the equal duration of the winds in the same place, during the different seasons of the year, are applied to points, whose position on a plane, or a sphere, or a cone, has been determined by pure convention, by a particular choice of co-ordinates to represent two variable elements [p. 514]. 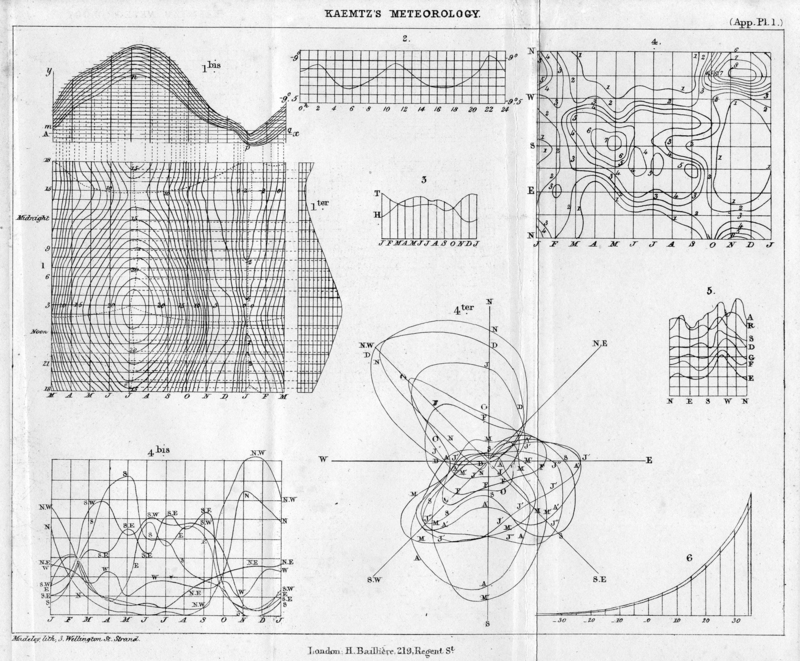 Lalanne’s “Appendix Plate 1.” From the English edition of Kämtz’s book, A Complete Course of Meteorology, trans. C. V. Walker (London: Hippolyte Baillière, 1845) [courtesy of John Delaney]. Not much is known about John Chappelsmith except that he was one of the best painters on founder Robert Owen’s staff at the idealistic community of New Harmony, Indiana. The wealthy English artist and his wife were among Owen’s scientists and educators who descended the Ohio River in the winter of 1825–1826 aboard the Philanthropist, symbolically representing a “boatload of knowledge.” Apparently, he spent most of his time making scientific drawings of fossils for government geological reports. He lived in New Harmony until his wife’s death in 1883, then returned to England, where he died several years later. Engraving of “Group of Trees Prostrated by the New Harmony Tornado” that accompanied Chappelsmith’s Smithsonian article. In his explanation of the plate, Chappelsmith states that it is another view of the group represented in figure 8 of the map, “about three hundred yards a little west of south of the five mile post on the New Harmony Plank Road” [p. 12]. 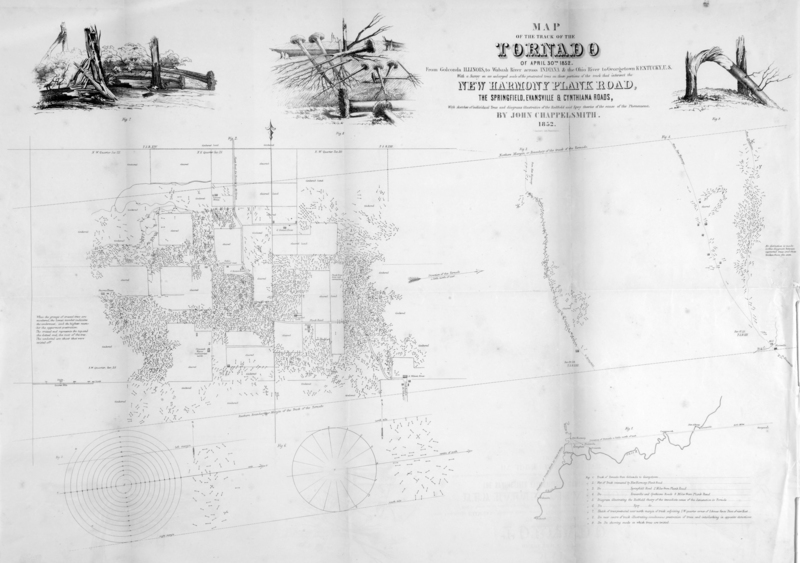 [Above] “Map of the Track of the Tornado of April 30th 1852. From Golconda Illinois, to Wabash River across Indiana & the Ohio River to Georgetown Kentucky, U.S. With a Survey on an Enlarged Scale of the Prostrated Trees on Those Portions of the Track That Intersect the New Harmony Plank Road, the Springfield, Evansville & Cynthiana Roads, with Sketches of Individual Trees and Diagrams Illustrative of the Redfield and Espy Theories of the Cause of the Phenomena. By John Chappelsmith. 1852.” Sheet size 55 × 74 cm. Accompanying his article “Account of a Tornado near New Harmony, Ind., April 30, 1852, with a Map of the Track, &c.” in Smithsonian Contributions to Knowledge (Washington, D.C.) 7 (1855): 1–13 [Historic Maps Collection]. First scientific study of a tornado’s path and the first conclusive proof that tornadoes are an inward, upward, and onward moving column of air. In his article, Chappelsmith notes that people living five miles north of the storm continued to plough their fields during the whole time. The tornado’s track was one mile wide and sped from New Harmony to Leavenworth in 1.5 hours, averaging sixty miles per hour and toppling trees at the rate of seven thousand per minute. Primarily based on his detailed examination of these prostrated trees left in the storm’s wake, he concludes that the “phenomena are incompatible with the rotary hypothesis. . . . I am inclined to believe in Professor Espy’s idea of an ascensional column . . .” [pp. 10–11]. 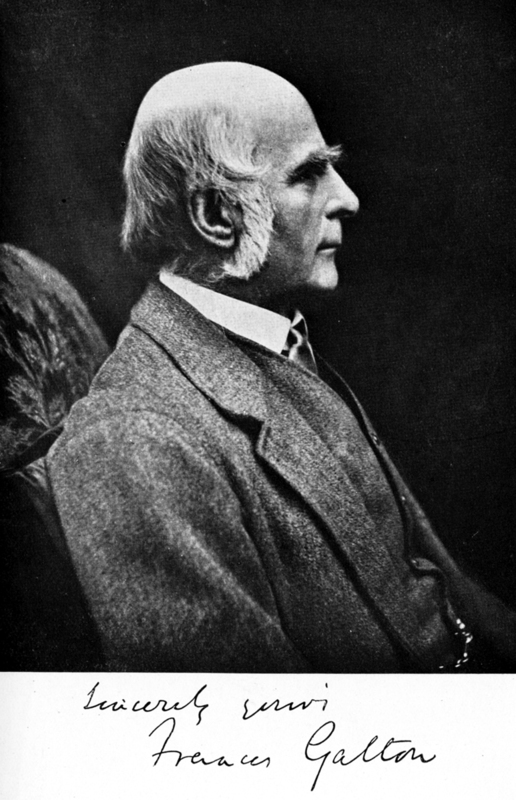 Portrait of Sir Francis Galton. From his Memories of My Life (London: Methuen & Co., 1909) [General Library Collection]. Geography: Galton financed and led a difficult exploring expedition (1850–1852) into relatively uncharted southwestern Africa (now Namibia), which won him a gold medal from the Royal Geographical Society. Statistics: Galton created the concept of correlation and popularized the notion of regression toward the mean. Heredity and evolution: He coined the word “eugenics”and the phrase “nature and nurture,” influenced by his half-cousin Charles Darwin’s theory of natural selection. Psychology: He founded psychometrics, the science of mental measurement (knowledge, abilities, attitudes, personality traits). He also introduced the methodology of surveys and questionnaires of human communities. Photography: He developed a method to form a composite portrait from photographs of several persons, with implications for shared features. Forensics: His detailed statistical analysis of fingerprints showed that the chance of two persons sharing the same characteristics was about 1 in 64 billion; hence, he greatly encouraged the use of fingerprints in criminology. His classification system survives today. 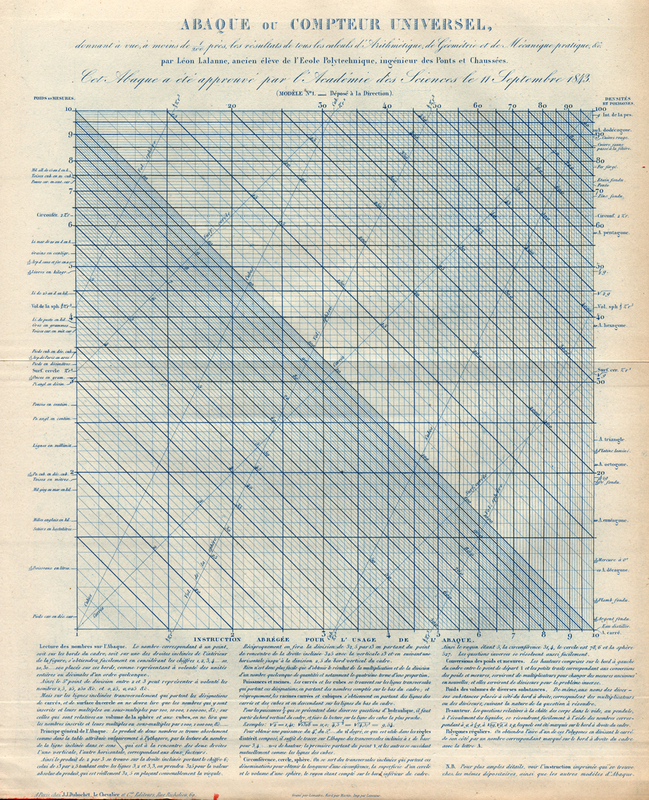 “English Weather Data, Feb. 9, 1861, 9h a.m.” Printed map, 24.5 × 16.5 cm, accompanying Galton’s piece on “Meteorological Charts.” From Philosophical Magazine 22 (1861): 34–35 [General Library Collection]. First European weather map for an actual time and place. In this brief article, Galton decries contemporary meteorological reports that are printed in columns in newspapers. Meteorologists require charts, he argues, upon which they can present detailed information in easy-to-understand fashion. Hence, he offers this map, printed with moveable type, as a possible solution. 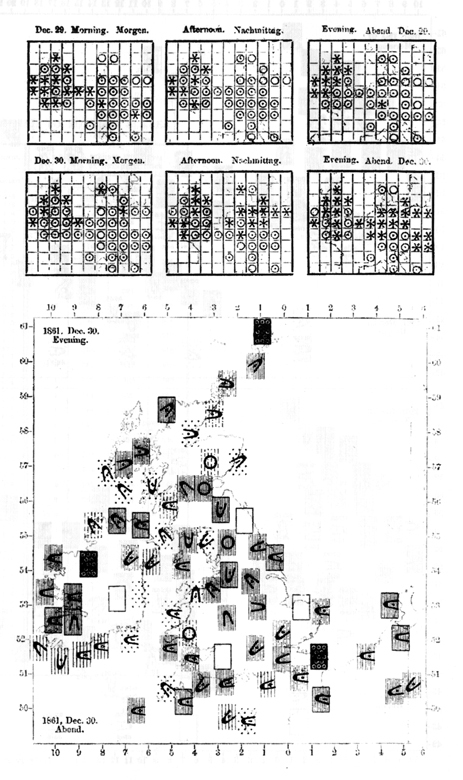 In discussing the map, which utilizes real data acquired from the time, date, and region in its title, Galton proposes a number of symbols that meteorologists might use to show aspects of weather. For example, he uses a horseshoe to represent wind and to indicate its direction, and the dot, minus and plus signs within it signify whether the wind is gentle, moderate, or strong; an empty horseshoe means that the force of that wind is unknown. Though Galton’s specific symbols were not adopted, his idea gained widespread support. Compare to the standardized weather maps in today’s newspapers. “European Weather-Charts for December 1861.” Brief report summary from p. 30 of the “Notices and Abstracts of Miscellaneous Communications to the Sections” in Report of the Thirty-Second Meeting of the British Association for the Advancement of Science, Held at Cambridge in October 1862 (London: John Murray, 1863) [General Library Collection]. 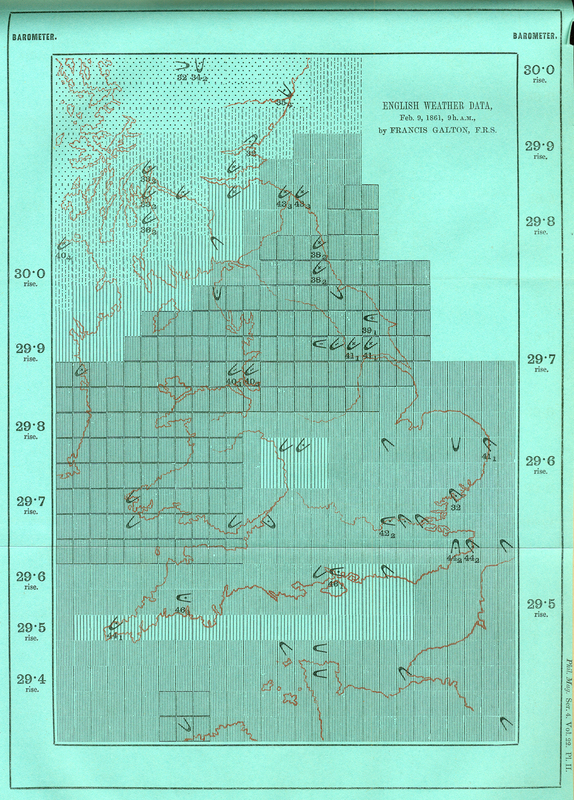 The maps alluded to here ultimately appeared in a separate publication by Galton: Meteorographica . . . , a landmark meteorological publication (see below). The work represents the study of weather across Europe, an area stretching 1,500 miles east to west and 1,200 miles north to south, during the thirty-one days of December 1861. Galton collected data from several hundred observers distributed over the region; included were thrice-daily measurements of temperature, barometric pressure, wind direction and strength, and cloud conditions. The results were reported on ninety-three (31 days × 3 times) maps. The accompanying Charts and Maps are contributions to a branch of Meteorology which is theoretically divisible into two separate portions, though they may be more or less united in practice, and it is convenient to class them under a single term,—Meteorography. I mean by that phrase, 1st, the art and practice of tabulating Observations which have been made simultaneously at numerous stations, each record being inscribed in the geographical position of the place where it was made; and, 2ndly, the subsequent step of delineating the General Results of the Observations in a pictorial form. The necessity and character of the double process I have described, may be illustrated by the well-known methods employed in Geography [p. 3]. Galton admitted, however, that it was impossible “at the present time” to scientifically study weather on a “worthy scale,” for want of accessible data. The three charts show barometric readings for the morning, afternoon, and evening of December 30. An empty circle, a circle with a dot, a star, and a black circle are symbols Galton used to indicate specific ranges of increasing barometric pressure. In the map for the evening of December 30, the U-shaped symbol shows the direction of the wind (its fill, the wind’s strength), and the Os represent areas of calm. The symbols’ rectangular background panels refer to rain and cloud cover. Untitled section of the page for December 30, 1861, from Galton’s Meteorographica, or Methods of Mapping the Weather; Illustrated by Upwards of 600 Printed and Lithographed Diagrams Referring to the Weather of a Large Part of Europe, during the Month of December 1861 (London: Macmillan and Co., 1863). Reprint by Archival Reprint Co., no. 32 of eighty-five copies [Historic Maps Collection].